Information on the behavior of polymers at high pressure cannot be obtained using conventional x-ray diffraction techniques, due to the lack of long-range order in the material. Such information, however, is becoming increasingly important due to the key role of polymeric materials in a number of modern technologies. An example is the behavior of polymer-bonded explosives (PBXs); an improved knowledge of the properties of PBXs at peak pressures is key to optimizing their use in real applications. At Carnegie, Summer Scholar Ari Benjamin (Williams College) and Research Scientist Muhtar Ahart, along with collaborators from Los Alamos National Laboratory applied Brillouin scattering techniques to investigating polymer behavior at high pressure, and succeeded in measuring the acoustic properties of KelF-800 to 85 GPa. Using information on the pressure evolution of longitudinal and transverse acoustic modes, the group was able to determine a full range of elastic properties for KelF-800. These challenging experiments yielded data on the C11 and C12 modulii, bulik, shear and Young's modulii, as well as the density of the material with pressure, which allowed a determination of the equation of state. Previous investigations on polymeric materials had only reached 20 GPa, so the current work provides new insights on the behavior of polymers at very high compression. 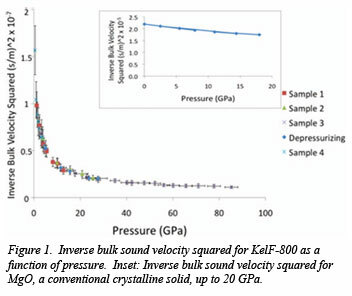 The results of the current work show that, over the pressure range up to 85 GPa, the data on KelF-800 is best described in two separate pressure regimes, which correspond to the material before and after the collapse of the free volume (Fig. 1). Prior to the collapse of free volume, most polymers will behave similarly, but at higher pressures, after the collapse of the free volume, polymers will tend to behave much more like conventional crystalline solids [A. Benjamin et al., J. Chem. Phys 137, 014514 (2012)].